On Monday, April 24, 2017, NatGeo TV’s long-running “Explorer” series featured a segment about Um Hanadi, a gutsy grandmother who is helping to drive ISIS fighters out of northern Iraq. 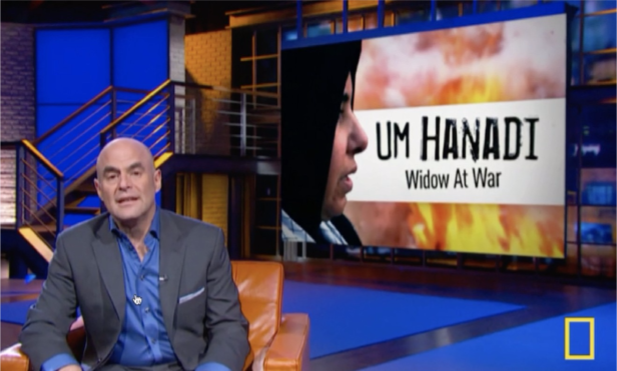 Except for archival CNN news footage, all of the video elements used in the “Um Hanadi” segment were supplied by WebStringers LLC, a Washington, D.C.-based media production company that specializes in operating in challenging environments, remote regions, conflict zones and areas with restricted media access. Material for the “Um Hanadi” story was gathered by WebStringers’s Iraqi crew, based in Baghdad, and embedded with Iraqi army and militia units liberating Mosul from ISIS occupation. Iraqi forces provided the WebStringers crew with extraordinary access to soldiers, residents, refugees and combat operations.